That photo is sure in synch wiht the sorry situation. Bighorn sheep sure do have an uphill battle to survive in the disease-denying 5th world country that is Idaho! Having made the mistake of subscribing to get various e-mail alerts from IDFG, I have been informed in the past week that 1) I can purchase for minimal fees tags to shoot NINE sandhill cranes. I kind you not. 2) Killing of pelicans may soon be done to promote some kind of exotic stagnant reservoir West Nile breeding water body exotic/hatchery fish. The current IDFG leadership and Commission are a disgrace. I was going to ask if people ate sandhill cranes but I did a search on “sandhill crane recipes”. I guess they do…it is amazing how educated a person can get using Google. 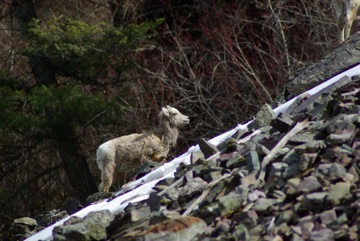 I’ve been trying to follow this wild vs. domestic sheep saga. If it passed that wild sheep will be killed to make the world safe for mouton, will one need to purchase a trophy game hunting permit? If so, how much is that worth to the state. Rhetorical question of the day: How can you harbor ill-will towards sand-hill cranes?